Akshay Balaprasad Dayma from Parbhani, B.E. - B.Tech Graduate. Working for : Kalika Steel Alloys Pvt. Ltd. Currently working as Maintenance Engineer at Kalika Steel Alloys Pvt. Ltd.
AUTCAD MS EXCEL SAP ECT. are one of expert skill area's of Akshay Balaprasad Dayma . 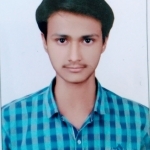 Akshay Balaprasad Dayma is working in Production/Manufacturing/Maintenance industry.